Expert tip: This is one of the most popular yoga retreats offered in Fiji. In this modern world, we have limited space and time to rest. There are many roles and responsibilities we have juggling work, family and other commitments. In this retreat, we will take care of you so that you are free to relax, restore and re-connect with yourself. This all-inclusive 7-day yoga, mindfulness and meditation retreat is all about you listening to your own needs and through our guided yoga, mindfulness and meditations sessions. Hatha Yoga promotes balance of the whole body. The sequences consist of long-holding postures, which help you connect your breath and body. Through the mindfulness sessions we will explore a variety of ways to cultivate non-reactive, calm presence. We will investigate using mindfulness to work with reactivity, the judgmental mind and the challenges of difficult emotions. The meditation sessions will focus on the cultivation of beneficial emotions and qualities, such as meditations to develop loving kindness, gratitude and compassion. 1 hour developing mindfulness session. 1 hour meditation to cultivate beneficial emotions and qualities. Yoga brings me physical strength and inner strength to face practical aspects of life while working in the corporate for over 10 years in Hong Kong. My passion for yoga encouraged me to leave the banking world and completed a Certificate IV in Yoga Teacher training in Byron Bay. 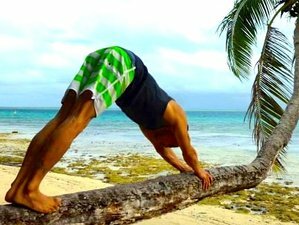 VAI YOGA was established in Fiji in 2015 and I spread yoga to both expats and local community. I continue to teach yoga after moving to Perth. I am studying at Curtin University, down the path I would like to combine medical based occupational therapy solutions and community based yoga to help people restore health. Kathryn Choules (PhD) lived and worked in Fiji for 2 years, and is looking forward to sharing the South Pacific experience with others through this retreat. Kathryn teaches mindfulness and meditation to support people respond to the inevitable stresses of the modern world and live more satisfying and fulfilling lives. Kathryn is a certified instructor of Mindfulness Based Stress Reduction through the University of Massachusetts and recognised as a Senior Teacher by the Meditation Association of Australia. As a researcher her teaching is informed by the growing scientific evidence base. Day trips to outer islands, including surf to Frigates! Tour desk and internet facilities – help you book number of things, include horseback riding, fishing, scuba (initiate from resort), the rest is outside resort grounds i.e. booking required at the front desk e.g. for the zip line. Spread yoga to all walks of life. Restoring physical and inner strength to face practical aspects of life.